During a livestream today, Bethesda revealed the newest expansion to The Elder Scrolls Online, bringing players to Elsweyr for the first time since The Elder Scrolls: Arena in 1994. The expansion comes with what Bethesda is calling the Season of the Dragon, pitting Tamriel's warriors against the series' dragon without the powers of a dragonborn on their side. 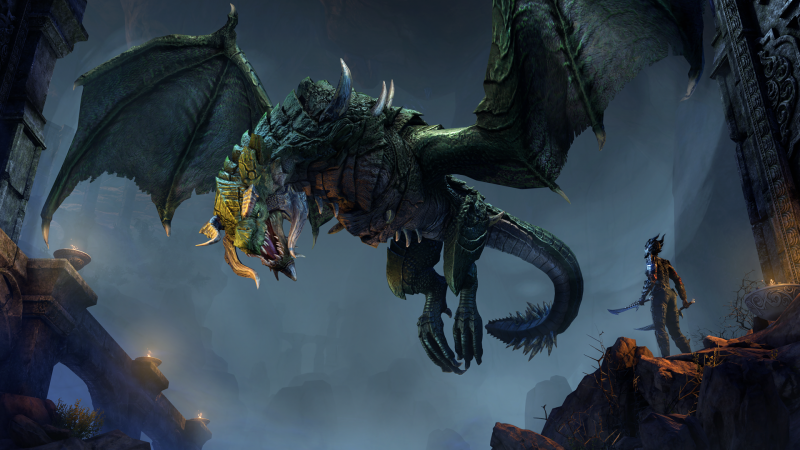 The Season of the Dragon is the title given to 2019's year of Elder Scrolls Online content, including the announced Wrathstone dungeon pack, a new Necromancer job class, and the unannounced dungeon packs for later this year. Elsweyr alone accounts for 30 hours of story content. Elsweyr can be played from the beginning by new players without any need to jump into older content. Similarly, existing players can start fresh in Elsweyr as a Necromancer. Players are tasked with defending the Khajit-born region from the dragon swarm lead by Kaalgrontiid. You can't rely on fus roh dah when there's no dragonborn to be found, so swords and shields will have to do. Elsweyr launches for all versions of Elder Scrolls Online on PlayStation 4, Xbox One, and PC on June 4.